Thanks to Sarah for sending on this article. Apparently, New York State is telling farmers market cheese vendors that they can no longer cut cheese to order or cut samples at farmers markets. To do so would require, as stores require, a license to process food as well as industrial kitchen infrastructure on premises (under that little tent…). This isn’t a WA issue yet for cheese. But it’s worth discussing. First, as someone in the field of public health, I understand where these kinds of policies come from. Public safety matters. Public safety involves avoiding contamination, something that happens best when we have strong policies in place so consumers can see how their food is being produced or processed and trust how it’s being handled when they can’t see it. But sometimes, in an effort to carry out the letter of the law and avoid exceptions, we end up with policies that make it harder for small producers to operate, or for customers to buy healthy food. We also end up applying policies in places they don’t really fit. We see this with regulations on carefully-produced, small-farm raw dairy, with vending at farmers markets, and with a lot of small-scale farming and food selling. 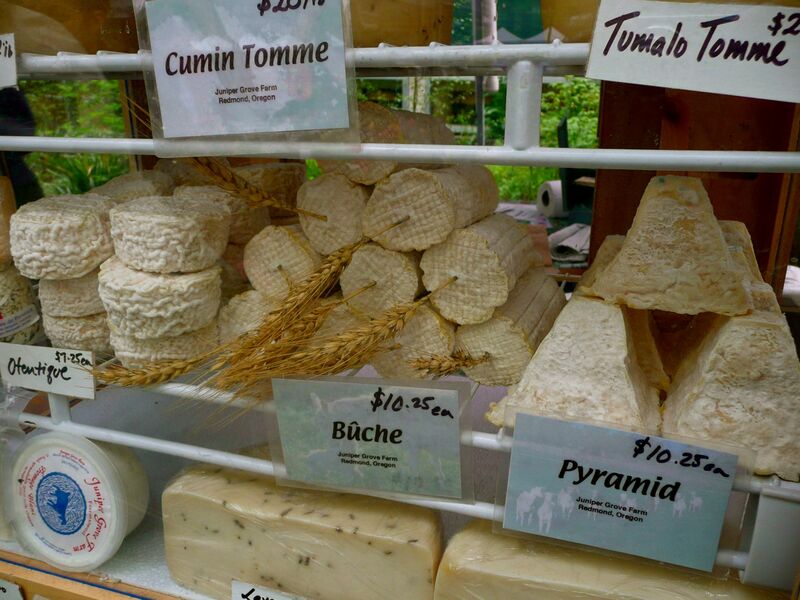 When small producers give up their farms and dairies, or customers buy fewer products at farmers markets, there are consequences for health, more definite (if less visible) than someone, say, getting sick and attributing their illness to mis-sliced cheese at a store. Less small-farm cheese sold at markets means less consumption of high-vitamin dairy, often from grass-fed cows. Not all cheese at markets has to be cut. The picture above is for one of my favorite cheese makers, in Oregon (that one with a stalk of wheat sticking through it is basically Debs-crack). But a lot of the less-expensive cheeses are sold by the weight. If you only want to buy a little bit of cheese, or can only afford a little, or want some of a hard cheese but don’t want, say, your own ten-pound wheel of cheddar, you need it cut. And it should be cut to order, so it stays fresh and so the customer can choose the amount. So, what to do? Advocate for exceptions to industrial rules that shouldn’t affect small producers or farmers markets. Get legislators and public health officials out to farmers markets, over to dinners. Communicate, connect, listen and explain. Make an emotional connection to markets, to healthy food. With emotional connections, common ground, and expression of understanding for where over-applied public health policies are coming from, we can start to make some gains instead of losing ground. I had to learn to like liver. It fit perfectly the definition of “an acquired taste” that I came up with as a teenager: A food that tastes strange to you, but you keep wanting to taste it because there’s something compelling about its strangeness. Then, one day, you like it. After I’d already learned to like liver, I had the chicken liver pâté at Le Pichet (their sister café, Café Presse, also has it). I realized it would be the perfect gateway food to liking liver. 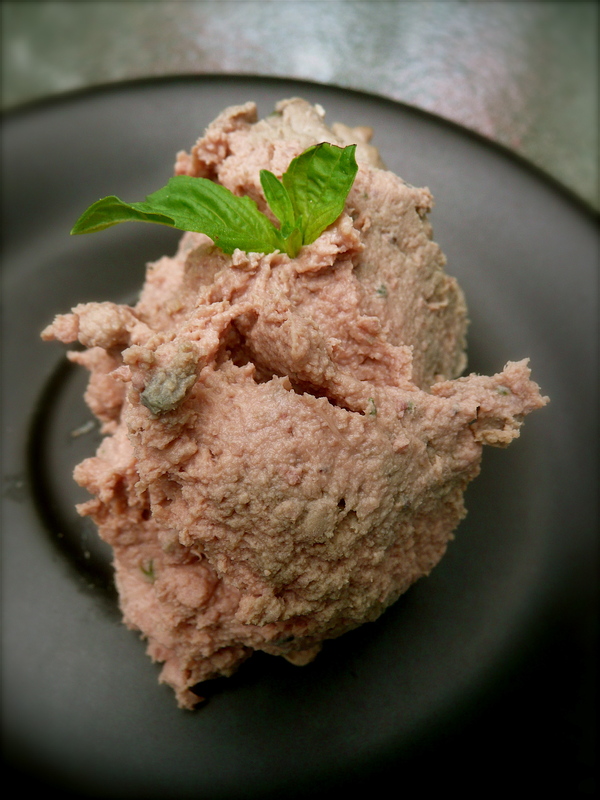 It’s whipped light and full of butter, flavorful but not so strong as straight-up liver is. I got the basic version of the recipe I now use from my friend Tatiana, and then modified it after reading Julia Child and adjusting for the flavors I like. To make this, you want to use livers from chickens raised organically and on pasture, since the liver acts as a filter, and since pasture-raised chickens will have livers (and eggs/fat/meats) full of important vitamins and good fatty acids. Organ meats from properly-raised animals are some of the most nutritious foods you can get. I get my livers at the U-District farmers market. And if you’re a first-time liver-eater, use a lot of butter. Heck, even if you’re not, use a lot of butter. The final product can be eaten straight, can accompany a salad, can be spread on toast, or can be served with vegetables like snap peas or spring carrots for dipping. 1. Soak the chicken livers in milk for an hour or so. This is to remove an edge of bitter or strong flavor from the liver. There is debate online about whether this works, but I like the flavor after doing so. 2. Drain the livers. Chop the onion. Cook very slowly on low heat in a lot of butter (about half a stick). Add a little salt and a few leaves of the thyme. 3. When the onion is completely clear, with a few edges starting to think about browning, turn the heat up, add more butter, and cook the livers. Sauté on all sides until browned, but still pink in the middle. Add the sage and thyme, and salt and pepper to taste. 4. Add the alcohol and stir. Let the alcohol bubble. 5. Pour all of this into a food processor with the cream and the other stick of butter (or more if you like). Process well; it should be very smooth. If you don’t have a food processor, you can use a blender, but the result may be a little more chunky. You can press it through a fine sieve with a wooden spoon if it isn’t perfectly smooth. 6. Refrigerate it. The mixture will be fairly liquidy, but will get more solid in the fridge overnight. This is true for many a mousse; even chocolate mousse should be fairly liquidy when you put it in the fridge. But, for the love of all things delicious, don’t confuse this container with chocolate mousse. Especially if you’re trying to learn to love liver. Serve with toasts, dipping vegetables, or salad. These are the collard greens that once spiraled me into full-blown Collard-Related Astonishingly Voracious Eating (CRAVE), a rare-but-not-so-serious ailment. Symptoms include compulsively buying collard greens and garlic, and longingly glancing at Brazilian restaurants. I still relapse pretty frequently. I first tasted collards like these at Tempero do Brasil, a nice Brazilian restaurant on the Ave in Seattle. They’re sliced into as fine ribbons as the knife can manage, and then sautéed simply with garlic, fat and salt. There’s a version with bacon, which I imagine is delicious for those who eat bacon. I started making these at home, and discovered they’re incredibly simple and quick to make. Just chop the garlic up finely. Use at least a few cloves, and more if you’re a garlic enthusiast. To slice the collards, tear or cut out the stem, all the way up to the top third or so of the leaf where the stem is no longer bulky at all. then, slice the leaf lengthways once. Finally, roll the leaf up and cut very fine slices off the end of the roll until you have thin ribbons of garlic. Sauté in olive oil, salting to taste. 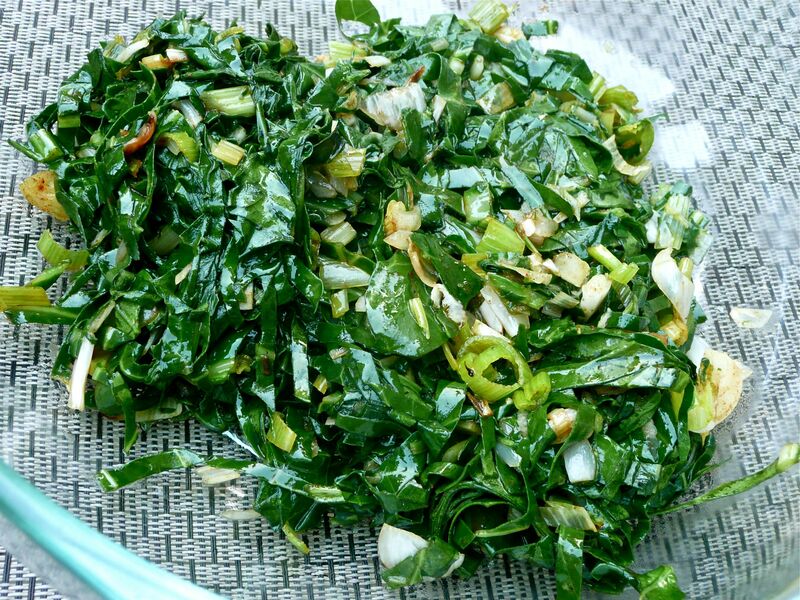 Collards are thicker than a lot of other greens, and so they hold their chewable texture well. They’re also smooth, giving a nice surface area for garlic, salt, and other flavors to show off. Because they’re sautéed quickly, these collards stay bright green and retain a fresh, bright flavor. That means they work well as a side dish, providing a refreshing and contrasting taste between bites of fish stews, black beans, chicken dishes, or spicy meats. 2. Remove ALL stems from collards, all the way up the leaf until the stem is no longer thick. 4. Roll the leaf up and cut VERY thin slices off the roll. Repeat this with all leaves. 5. Heat oil. Add garlic and stir a few seconds. Add collards and stir well, coating the leaves. Sprinkle in salt. 6. Collards should cook only a few minutes. They’re done when all the dull, green raw-looking parts of the leaves have transformed into a bright, glossy, slightly-wilted green. Taste for salt and serve hot.